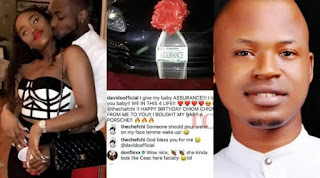 Aide to Delta state governor, Ossai Ovie Success, has condemned Nigerian singer, Davido’s N45million porshe for his girlfriend, Chioma, who has just turned 23. Ossai who happens to be Nigeria’s youngest political appointee, who took to his instagram and facebook account: “Davido should have invested the money into buying a plaza, opening a business or something that will yield profit for her instead of buying his girlfriend, Chioma a liability. “I am not against buying someone you love a gift but before doing that think of more positive ways of affecting her life. “The truth should be told, the best gift you can buy for the woman you love on her birthday or anniversary, is to buy her something that will yield her profit. “Don’t buy your woman a liability, N45million porsche for Chioma at her age is a liability to her, I don’t celebrate liability and won’t celebrate this,” he said while calling on Nigeria youths to invest their money wise and avoid show off.